Ah Holo, how easily have you been forgotten! No sooner had Material Design been announced that we scrapped your vibrant black and blue, your grey boxes, your app tabs, and started championing white everywhere and animations. It's clear that Holo doesn't want to die, or someone at Google doesn't think Holo should be completely gone from Android, if only because it's good to see where you came from to appreciate the road you've been on. Like keeping that old photo of your acne-filled face or that baggy pair of pants that you used to wear before losing weight. It's great for reminiscing and comparing. Some users, whether they're running Android 6.0 or 6.0.1, on different phones and tablets, old and new, are seeing this Holo screen prompt when they download a new app or update from the Play Store. 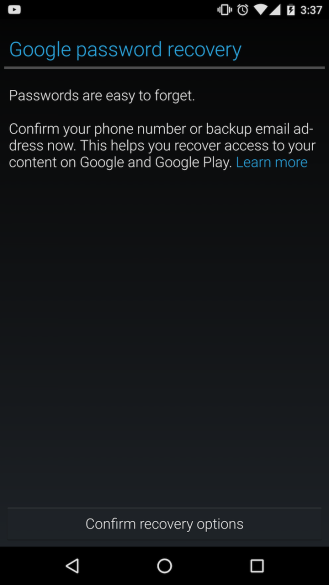 It's definitely jarring when you run across it the first time on your modern phone, and you might wonder if it's a legit pop-up or some smart ad masquerading as a Play Store prompt. Some are reporting it frequently popping up, others are seeing it sporadically. The annoying part, however, is that when they follow the prompt to update their recovery options, many users are facing an issue where it won't accept their alternate email. It says that the country is not valid... as an error for inputting an email address. That makes sense, sure. 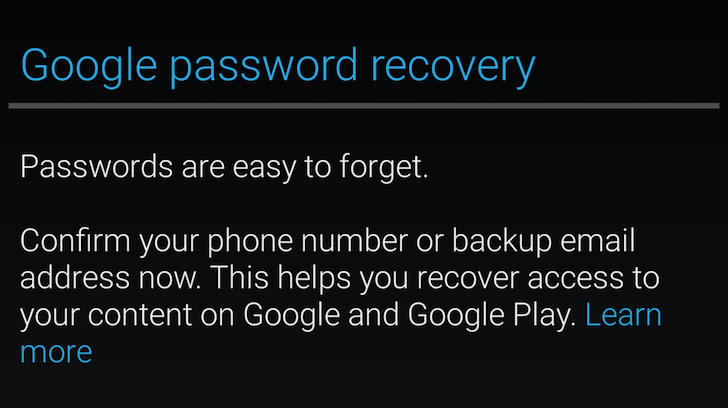 There doesn't seem to be a way to completely get rid of the prompt aside from confirming your recovery options and hoping that the Play Store deems this enough to stop annoying you.